Anna Komis | Pump That Pedal - We've got it, You want it, Come and get it. What cars do you or have you owned? All kinds! She gets in a bit of a jam trying to turn the Volvo around in a tight spot. It’s made more difficult because she’s still trying to get reacquainted with a stick shift vehicle. I talk her through it as she stalls the car out often trying to turn it…. It’s been a while since she’s driven a stick shift, so I figured we’d give her some seat time in one and try to move the Volvo. She’s tall as hell, so even with the seat all the way back she’s still barely able to fit in the car. I…. This super-tall, long-legged beauty has a little 1-on-1 time with the Volvo…which isn’t starting…imagine that! lol She pumps the pedal lightly and goes at it for a few minutes before finally getting it started to where she can move it and park it. She’s still at it, trying to get that Volvo started in those hi-top sneakers! Her legs are so long, she just rests her wrist on her knee when she cranks the key. 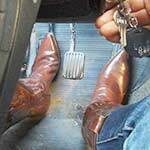 Her bracelets are clinking and clanking as she moves it around between the key and gear shifter. Some…. This super-tall gal tries her luck at getting the old Volvo to run. It sputters and half-way runs some but it keeps dying. There is a part where she gets it running and moves it a bit but she’s rusty at driving a stick and stalls it out…which floods it…. She loved the Bug even though it was tiny. She hops in and gets it started after a good bit of struggling. Those size 10 Keds cover that entire pedal. 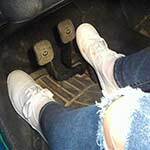 So we’re back with the long-legged Anna as she finally gets the Camaro fired up and I quickly show her the gears because the needle on the dash doesn’t work. After that, we’re good and we go for a drive that isn’t without a few issues. Fortunately, we make it…. This girl barely fits in the Camaro. With the seat all the way back, her knees are still all up in the dash. She struggles with the old Camaro to get it started. Her white, size 10 Keds show up well in the footwell as it’s overcast today. She keeps…. She gets the old little Bug fired up quickly and then gives it a nice revving with her super long legs and size 10 foot! Part 2 and Anna still isn’t making in progress in the old Chevy!